It’s so important to set yourself goals. Whether it be big or small. Long term or short term, goals are what keep us going. They give you that ending point and something to work towards, thus building you as a person. And if you’re anything like me, you’ll be writing these goals down all the time. stacked in a dairy with be endless amounts of bucket lists and 2016 goals. And, they tend to be pretty samey. The whole ‘get fit’ or ‘get this much on Twitter’ malarkey. But, sometimes we need to think more about our goals and what we want to achieve. Both on the larger and smaller spectrum. So when I got an email from Mooku asking whether I’d like to have a look at one of their ‘Weekly goals’ PDFs, I couldn’t deny. In their email they explained to me that all their products work alongside the idea of mindfulness and getting a person to think more. 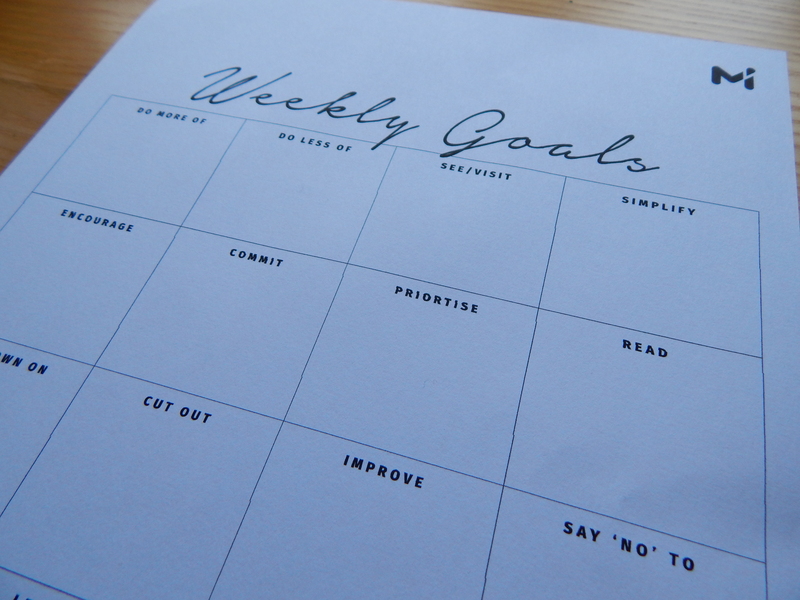 This weekly goals planner they actually worked with a couple of psychologists to produce. The idea was that the questions asked give you the most well-rounded view of your life on a week-to-week basis, asking you questions you might not have asked yourself and forcing you to think! Initially they just asked for some feedback in an email. But I wholeheartedly believe this to be such a wonderful thing that I had to write a post about it! If anything it is just such a pretty, simple layout. It’s formatted with lots of boxes saying different. Rather ambiguous and open ended words or phrases to answer. And they really do get you thinking. Because, you just don’t think about anything you want to cut out or simplify that week. And you then begin analysing your week and all the little bits you may have forgotten about. Then, after your brains been ticking over and you’ve filled it in. You can pin it up or place it somewhere you can see it and be reminded of these little things throughout your week. Again, I think this is such a lovely idea. And as someone who is an avid lover of all things mindfulness I’m always so intrigued to look at new things. It’s nice to see something which has stripped back the concept of mindfulness and is as easy and simple as this. Nothing but a pen and your mind needed, but is also effective. It’s hard to portray the effects. But I truly felt like I was more aware of my everyday activities and thoughts when doing this little planner. I both appreciated things more and began to evaluate and resolve the bits that maybe stressed me out or made my unhappy. All because of some boxes with words on. It really is as simple as that! Definitely go check out the Mooku shop on Etsy as they have so many lovely products! Novice To Know It All: Twitter Chats. There’s nothing more satisfying than being able to clearly see a goal written down and saying you’ve done it. This is such a different type of layout and I love it! Could really use these in the household – thanks for sharing! Thats so true, it’s a feeling nothing can compare to. Its such a lovely process! Thank you for reading! This is such a fantastic idea, I need to check out Mooku! I love that each day has a ‘stop’ and ‘say yes to’ box, as this really focusses your mind when setting goals and encourages you to step outside your comfort zone! A great post as always, Em! I like this, for people who need to jot everything done (like me) 🏁this works! PS your handwriting is so cute lol. Nothing feels better than accomplishing goals that has been set for the week! Great post! It’s so different I love it! Aha same gal same! I love this idea! I’ve been reading a lot into mindfulness and love the whole concept. I always feel like I set myself long term goals and then get really dissapointed when I don’t achieve them so I love this idea! I love the concept of mindfulness, I’ve really followed it the last 2 years so anything related always interests me! Then this is perfect for you lovely! Loved the post, i definetley need to start setting myself new goals! Thank you! Do it do it! This is such a great idea! Ps I love your photography! 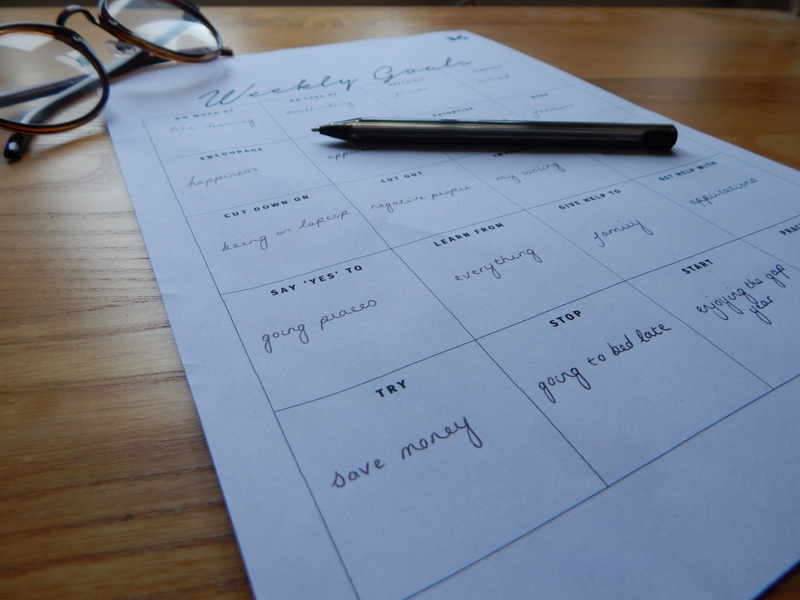 I set myself monthly targets over on my blog, however this way of setting goals/targets looks amazing! Thats a good way of doing it I’ve never though of that! I love writing stuff down it’s my favourite way of getting my goals down! This is a lovely post, I’m far too unorganised and need to be more like this! Thanks for sharing! !